As global climate continues to change, the question of the potential economic consequences of this change on the world’s food supply is one that scientists have been endeavoring to answer. Previous research has produced wide variations in results concerning the future of prices, production, and trade. The Agricultural Model and Intercomparison and Improvement Project (AgMIP) in association with the Inter-Sectoral Impact Model Intercomparison Project (ISI-MIP) is leading a global economic model intercomparison, which harmonized the input datasets for 10 global agro-economic models to better evaluate the model results. Each of the economic models ran simulations with standardized initial conditions for multiple scenarios, as outlined in von Lampe, et al. (2014). Through harmonizing the model inputs, this effort hoped to shed light on the different behaviors and more subtle aspects of heterogeneity between the 10 global economic models with the goal of leading to meaningful analysis and inter comparison. This article briefly reviews seven studies recently published in a special issue of Agricultural Economics, and introduced in a paper by Jerry Shively and Gerald Nelson (Weblink). 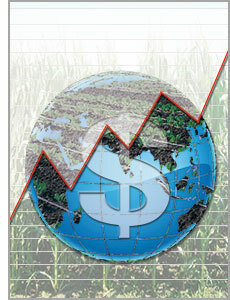 The first article, “Why do global long-term scenarios for agriculture differ? An overview of the AgMIP Global Economic Model Intercomparison” (Press Release Weblink), reviews the methodology and analyzes the differences between model results. The second article, “Agriculture and climate change in global scenarios: why don’t the models agree?” (Press Release Weblink) reviews the effects of climate change shocks simulated by the global agro-economic model intercomparison. The next three articles, “Impacts of increased bioenergy demand on global food markets: an AgMIP economic model inter comparison” (Press Release Weblink), “Land-use change trajectories up to 2050: insights from a global agro-economic model comparison” (Press Release Weblink), and “The future of food demand: understanding differences in global economic models” (Press Release Weblink), specifically analyze how the models differently treat bioenergy, land-use and food demand respectively. The next article, “Projecting future crop productivity for global economic modeling” (Press Release Weblink), looks closely at the uncertainties that arise from scenarios imposed on the global economic models. The last article, “Comparing supply-side specifications in models of global agriculture and the food system” (Weblink), reviews the structural differences in the ways in which models simulate the agricultural sector, specifically the differences between partial equilibrium (PE) and computable general equilibrium (CGE) models. All of the articles prove the efficacy of conducting a study harmonizing the inputs and demonstrate how the difference between the models is greatly reduced by this process. However, all of the articles also highlight that this is just the first step required by rigorous model intercomparison and improvement efforts and that future coordinated studies will be necessary to reduce uncertainty and improve the forecasting abilities of the models. This AgMIP global economic modeling group study relies on the method of harmonizing model inputs between the 10 economic models to more accurately compare the simulated crop yields and the global economic responses to climate change. The first method of comparison involves grouping the results into five categories of agreement and disagreement. Additionally, the study employs an econometric meta-analysis to study the price changes both over the duration of the reference scenario as well as between the reference scenario and the alternative scenarios. The study also tests the hypothesis that computable general equilibrium models (CGE), as compared to partial equilibrium models (PE), have greater flexibility when responding to exogenous shocks and thus forecast smaller price changes. While previous studies have demonstrated that global economic models predict price changes in similar directions, the magnitude of the changes widely varied between the models. This study found that harmonizing the model inputs greatly reduced the range of price changes induced by the different scenarios while also leading to greater uniformity in other model outputs. Furthermore, this comparison revealed other commonalities between the model results including similar hotspots of future agricultural growth, greater impact of productivity progress over expanded agricultural land-use, and an increasing role of international trade. Accordingly, this study recommends the formation of national and international policies, development of private investment strategies, the maintenance and expansion of domestic infrastructure, and the liberalization of international agricultural trade to prepare for the effects of climate change. Despite the similarities between the model outputs, this comparative analysis identified discrepancies between the model outputs, which led to uncertainty, and merit future analysis. Many of these differences arise from contrasting assumptions about the future behavior of the global population. Specifically, differences emerge from the estimated, long-term future demand as impacted by increases in income and the associated rise in food consumption as well as alterations in consumption patterns. Moreover, assumptions about rates of agricultural land-use change and technical advancement expose additional areas of uncertainty that require further research. Regardless, this study demonstrates the benefits of harmonizing model inputs to reduce model disagreement, identifies important factors that will drive agricultural markets in the future, and outlines several structural modeling components and assumptions that could benefit from further research. Gerald C. Nelson et al. Agriculture and climate change in global scenarios: why don’t the models agree? This study conducted by AgMIP’s global economic modeling group compares 10 of the leading global economic models with the objective of identifying the factors that lead to differing model outputs with respect to a number of climate change shocks. To better understand these differences, each of the economic models ran multiple scenarios as well as one baseline, or reference scenario, with a common set of climate, crop, and socioeconomic input variables. The scenarios use climate data from two general circulation models, IPSL-CM5A-LR and HadGEM2-ES, crop data from two crop models, LPJmL and DSSAT, and socioeconomic data provided by the Shared Socioeconomic Pathway 2 (SSP2) created for the Intergovernmental Panel on Climate Change (IPCC) 5th Assessment Report (AR5). The study then divides the influence of climate change on agricultural yields into the three components: consumption, area and yield. The effects of yield shock are compared to the baseline scenario to measure the climate change response and then are used to evaluate the impact of the different scenarios on crop prices. This comparison highlights a number of differences between the models while also identifying areas of future analysis. Most notably, the models tend to have similar demand responses to climate change but the study did not closely scrutinize the differences in the supply responses and recommends that this area be analyzed in future studies. Similarly, the effects of climate change on crop prices are closely linked to the responsiveness of the change in the quantity demanded as compared to the change in price, or the price elasticity, a variable exogenously determined by each economic modeling group. This comparative study confirms other research suggesting that the models’ price elasticity may be calibrated for near-term forecasting rather than the longer-term responsiveness that would be required for predicting price effects over the next 40 years and demonstrates how model outputs are similar when harmonizing input variables. For the studied climate change shocks, globally yields and consumption tended to fall, while agricultural land- use and prices tended to rise. However, the magnitude of such changes varied widely between the different models indicating that the model structure and implicit parameter choice have a large impact on the model outputs. This study recommends further econometric and validation studies to reduce the model output differences and ultimately reduce the uncertainty that arises from such modeling efforts. To meet the predicted global rise in food and energy consumption by 2050 as well as adhere to the ambitious greenhouse gas (GHG) emission targets needed to constrain global warming to 2°C above pre-industrial levels, the Integrated Assessment and other energy modeling efforts have demonstrated that energy created from agricultural biomass will be a crucial component of the future energy mix. Previous literature has shown that current biofuel generation has directly pressured global agricultural markets while also providing low GHG savings at a relatively high abatement cost. To research this increasingly important energy source, five global economic models were used to study the future effects of a bioenergy production expansion on agricultural land-use and global food prices. This AgMIP global economic modeling group study conducted model intercomparison as well as compared the impacts of an increasing, long-term bioenergy demand to the impacts of climate change on agricultural production. To more accurately compare the model outputs, inputs were harmonized by the same methodology previously outlined and multiple scenarios were run by the models. The demand for biofuels was largely determined by current public policy commitments, although this factor was not fully standardized due to structural differences inherent to the models. This difference in biofuel demand implementation, along with differences in productivity changes, varying degrees of production substitution, and levels of international trade, drove the models to respond differently to changes imposed by the scenarios. As a result, the models simulated significantly different responses in the allocation of bioenergy production, the area of land-use change, and the levels of demand and international trade. The models generally agree that the impacts of biofuel production on agricultural production and land-use change are relatively modest insomuch as the land supply is made available for increased biofuel production. This study, however, did not consider the implications of water scarcity and nutrient depletion, constrained agricultural land expansion, or welfare losses imposed by emission restrictions. If these factors would have been included in this assessment, particularly in regards to constrained agricultural land expansion, the models likely would have predicted greater effects of climate change on global food prices. Further research will be required to include these factors and more fully harmonize the models to allow for improved model intercomparison. The past 50 years witnessed a relatively small expansion of agricultural land (15%) in comparison to the increase in agricultural production over that time frame (200%). However, to meet the increasing global food demand into the future, it is unclear whether productivity will continue to increase rapidly or if there will be an expansion of agricultural land-use. To address this question, this study compared the land-use changes predicted for four socioeconomic and climate change scenarios of 10 global economic models. The incorporation of land-use changes in global economic models is a relatively new component and as a result there are large uncertainties between the models and the predicted changes in land-use. Yet, much of these differences between the models arise from the uncertainty of economic and demographic development as well as structural features within the models. To address these uncertainties, the AgMIP global economic modeling group has harmonized key input variables and assumptions to allow for a more uniform comparison. Importantly, many of the models harmonized their technological change (TC) rate as this factor is an important driver of changes in land-use. The harmonizing efforts substantially reduced uncertainties between the model results and a couple of notable similarities were observed between the models. All of the models simulated an increase in land-use while also suggesting that Africa will have the greatest expansion of agricultural land in the future. Many of the similarities that were observed between subsets of the 10 models could be explained by similarities in model structure, which also explained the differences between the subsets. The differences between the models’ predicted land-use changes appear to be influenced largely be differences in the cost of land expansion, the predicted regional productivity responses and the assumptions about future land availability. This first comprehensive global economic model intercomparison study of land-use changes highlighted structural differences between the models and has exposed the need for validation either by hind casting or back casting. Further study will also be needed to more accurately model TC as this is a decisive variable driving land-use change. While food production has largely kept pace with the increasing global demand driven by population growth, there are concerns that climate change, nutrient depletion, and water scarcity will threaten the ability for the agricultural sector to satiate the food demand in the long-term. This study compares the demand modeling approaches of 10 global economic models in association with the AgMIP global economic modeling group’s strategy of model intercomparison. By using eight scenarios of socioeconomic development, climate change, and bioenergy expansion to harmonize the model inputs, this study is able to more accurately compare the food demand projections of the global economic models in 2050. Ultimately, this comparison demonstrates that food demand is more sensitive to socioeconomic drivers, mainly population growth but to some extent income growth as well, than the effects of climate change or bioenergy expansion. All of the models project higher increases in demand than was projected by the Food and Agricultural Organization (FAO) in the baseline scenario. These differences are impacted by assumptions about economic growth under the scenario’s rate of population growth. However, differences in factors of economic growth do not entirely account for this discrepancy. The results were decomposed into the components driven by economic growth, the income effect, and by the role of prices on demand, the price effect. The models have different price trends and have varying levels of sensitivity to price changes, which can either increase or decrease the effect of economic growth on demand. The sensitivity to climate change and bioenergy generation were also evaluated but found to be far less influential than the socioeconomic drivers. Modeling food demand is difficult due to the high degree of uncertainty surrounding the main socioeconomic drivers of population and economic growth. As a result, the model results of food demand vary widely across the models. The models do agree, however, that the increase in demand will be greater than that forecasted by the FAO suggesting that there will be a greater required increase in global agricultural production to meet demand than projected by the FAO. This comparative analysis concludes that there will need to be further research conducted to determine how best to simulate income elasticity and the magnitude of the price effect impact on model projections, both of which will be integral to accurately modeling food demand. Christoph Müller and Richard D. Robertson. Projecting future crop productivity for global economic modeling. This article analyzed the uncertainties of the scenarios imposed on the 10 global economic models as part of AgMIP global economic modeling group’s strategy of model intercomparison and specifically studied the uncertainties that arise from the spatial patterns of crop productivity. Using the scenarios and methodology outlined in Nelson, et al., the global economic models agree that there will be a loss in agricultural production in most regions by 2050. This analysis demonstrates the limitations of the scenarios as well as the strengths, discussing and validating the methodology used by the intercomparison effort led by AgMIP. This study concludes that the uncertainties that arise from the spatial patterns of crop productivity pervade, in part, from the uncertainties that exist in the climate projections as well as from differences in the impact model that is used by a particular modeling group. The shortfalls of the scenarios are thoroughly discussed, including but not limited to the modeling of extreme weather events, the lack of pathogens/weeds that would affect crop growth and development, relatively static management systems, and the small number of crops considered in the simulations. Ultimately, the study concludes that the uncertainties from the climate projections and impact models need to be more fully appreciated by economic assessments of climate change into the future. Sherman Robinson, et al. Comparing supply-side specifications in models of global agriculture and the food system. This study compares the two most common forms of global economic models used in the AgMIP global economic modeling group’s strategy of model intercomparison, the partial equilibrium (PE) model and the computable general equilibrium (CGE) model. PE models have been used in the agricultural sector for many years but typically do not cover all of the production markets. However, PE models have a finer resolution and thus are able to more easily simulate biophysical factors including degradation of soil quality, water availability and climate change, In comparison, CGE models, which were developed to analyze macroeconomic and trade policy issues, are typically larger scale and have only recently been used to simulate the effects of climate change. This study focuses on the differences between CGE and PE models regarding the specification of agricultural technology and supply behavior for long-term global food systems. The scenarios allowed the models to be more fully harmonized thus reducing the differences, suggesting that both structural model forms produce consistent and empirically significant results. While CGE and PE models handle these aspects of supply differently, this research concluded that these discrepancies do not translate to major differences in the model outputs. The article outlines methods by which CGE and PE models could be run to more effectively compare the underlying supply and demand functions that drive these models, although the study concludes that this effort led by AgMIP to harmonize the global economic models was a definitive step in the right direction.